Electric Shock Feeling during Sleep: What's Happening? Being woken up by a series of electric shock sensations in various parts of the body is one of the most unpleasant symptoms middle-aged women experience. They can occur on the back, in the arms or legs, and even pierce through the head. Fortunately, they are harmless and usually do not indicate a serious medical condition. Learn more about the most common causes of the electric shock feeling during sleep. During menopause, hormonal imbalance might cause electric shock sensations throughout the day and night due to rapid shifts in estrogen levels. 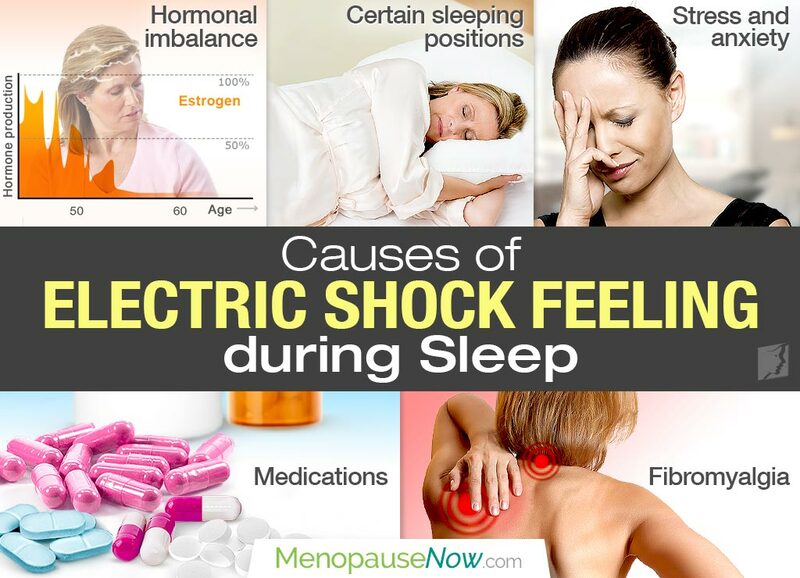 Moreover, women who suffer from other menopause symptoms, such as hot flashes or night sweats, report that they often induce electric-like shocks during sleep. Certain positions during sleep might cause vertebrae to put a temporary pressure on the nerve, triggering a series of electric-like stabs in the back, neck, or the extremities. Occasionally, women might suffer from certain age-related chronic back conditions, such as slipped disc or spinal stenosis, which can be more pronounced in horizontal positions. Long-term stress and anxiety are one of the known causes of electric shock feelings. At night when our bodies relax, the mind is very vulnerable to overthinking and being bombarded with intrusive thoughts. Those anxious thoughts and feelings are believed to over-activate the nervous system, causing a miscommunication between neurons. Lightening-like jolts are a result of that. Certain medications to treat depression, anxiety, and migraines have been shown to trigger electric-like shocks, especially in the head. Women can experience them during the day and while sleeping. Ironically, their discontinuation might also trigger this symptom. It is more common in women than men, and it often causes pain and electric shock sensation during sleep, which in turn, disturbs the sleep cycles, increases fatigue, and makes women more prone to depression and cognitive problems. It is understandable that a sensation of electric-like jolts during the night fill most women with fear, decrease the quality of their sleep, and increase their fatigue. Although in some cases they might signal a more complex underlying disease, which require a prompt medical attention, most often these electric shock sensations are not dangerous. If you feel that interrupted sleep is taking an increasing toll on your daily functioning, ask your doctor to help you treat them better. Also, let your doctor know when electric-like stabs are accompanied by severe pain, vision problems, or any other abnormal symptoms. Electric-like shocks at night are a faithful companion of many menopausal women. Sometimes a good quality orthopedic mattress can reduce the problem and guarantee a good night sleep. Other times, meditation or yoga classes help prevent anxiety and lessen electric-like shocks during sleep. If you have trouble managing nocturnal electric shock sensations, some of the home remedies for menopausal electric shocks might help you get a restful night. Blows, W. (2002). The Biological Basis of Mental Health Nursing. Routledge: New York, USA. The electric shock feeling is one of the least-understood of all menopause symptoms - not only by the average person, but even by many experts.